Studio work has seemed very stop-start recently. I’m finding it difficult to settle down to work consistently. When I am working I seem to jump from one activity to another and keep thinking of other things I need to do. It’s making me feel restless and a little dissatisfied. However … I am fairly happy with the results of my latest round of dyeing. I pinned everything up to have a good look. Lots of small scraps because I don’t like to waste offcuts of antique linen. I over dyed some rejected screen prints too. Technically, all shades of brown. But one of the browns had quite a strong green tone and there was blue and black dye on some of the offcuts. As I pinned things up I enjoyed playing with some of the colour and texture combinations. I particularly like some of the pales ... though they are tough to photograph. Then I added some scraps from a different dye session - shades of dark blue. By now it was getting harder to find space to pin anything new, but the blues combine well with the browns and creams. I’m leaving everything up for a while so that I can keep looking and consider the possibilities. The last colour study gave me an idea. But before I can try it, I need a selection of browns and greys I can use. Because previous studies have focused on over-dyeing, I needed to do some colour mixing. I looked at previous studies, both those done with thickened dye and in the bucket, and selected nine different ratios of red : yellow : blue that showed the potential to result in a neutral. I knew that different combinations of primaries would give different kinds of neutrals. I also knew that some ratios would be more likely to result in a neutral than others. Once I started, I also became fascinated by the effect of changing the relative strength of the dye concentrates themselves. This is something I've experimented with before but this was an opportunity to explore it more thoroughly. Sometimes this could make the difference in whether I achieved any neutrals at all. Above is an example of what I mean. These three sets all used the same primaries (scarlet, golden yellow, royal blue in this case). In the one on the left the relative strength of the dyes was 1:2:3 (weak red, strong blue); the middle set is 2:2:3 (strong blue); and on the right, 2:3:2 (strong yellow). Not in this picture, I also did a set of 1:1:1 (equal strength) for each set of primaries. The same dyes, the same mixing ratio in each row, different relative dye strengths. Once I'd finished, I found that the ratio of dye strength most likely to give neutrals, for any combination of primaries, was either 1:1:1 or 2:3:2. In the picture above, each row represents a different mixing ratio of red : yellow : blue. In this case, the primaries were scarlet, lemon yellow and royal blue. I started with nine different ratios but gradually eliminated those that rarely resulted in a good neutral so that by the end I was using just six. In the best cases, any of these six could give a neutral. But across all the combinations of primaries I tried (six in all), the most reliable mixing ratios proved to be 3:2:1, 2:3:1 or 3:3:2 - i.e. the third, fifth and seventh rows in the picture above. And the best combination of primaries? Scarlet / Golden Yellow / Royal Blue produced warm neutrals and has a bias towards green. Or Scarlet / Lemon Yellow / Royal Blue, which gives much cooler neutrals and has a bias towards blue. Magenta or Scarlet / Golden Yellow / Turquoise were also good, but only if you strengthened the yellow so that it could stand up to the turquoise. Unsurprisingly, the worst combination from this point of view was Magenta / Lemon Yellow and either Turquoise or Royal Blue - which both yielded a lovely range of violet (above). So the next time someone tells you that mixing all three primaries together will result in "mud", challenge them to try it with those three. And if they challenge you, strengthen the yellow and mix in a ratio of either 2:3:1 or 3:3:2 and it's possible to get a grey - a blue-grey but still grey. After my last post, of course I got back to work. I still feel I'm avoiding something - dyeing is very much in my comfort zone - but work is work. The main activity has been dyeing colour families based on the complementary pairs I developed in June's colour study. There are different systems for doing this - the one I use is based on Leslie Morgan's - we share a fascination with this kind of study. The basic principle is that you dye three (or more) strengths of one colour and then over-dye the results with three (or more) strengths of a second, distributing the different values from the first round between the vats for the second. 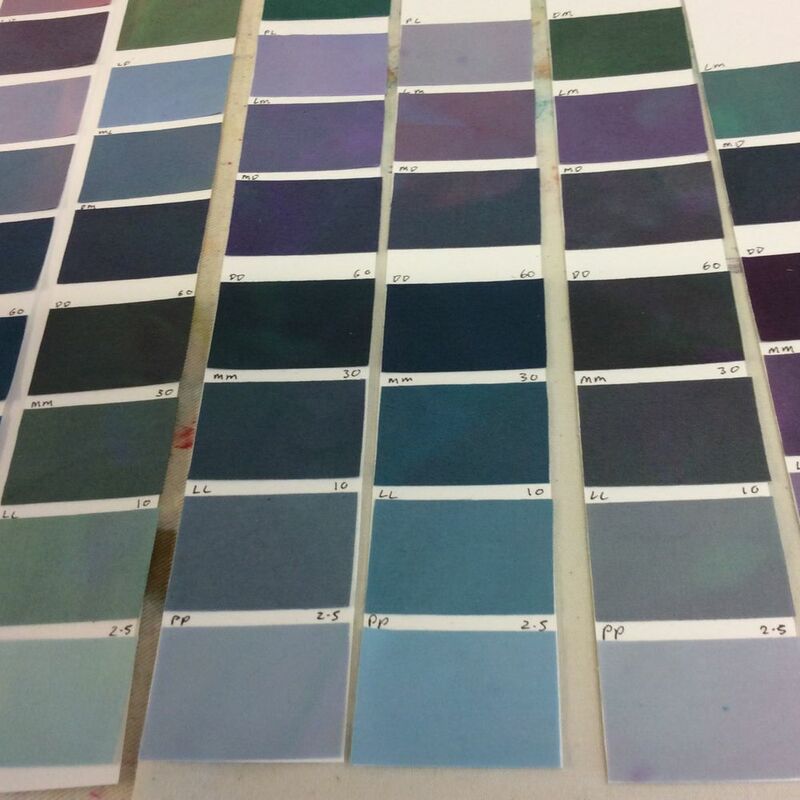 The outcome is twelve different values and hues out of three dye vats. This is the system I use for shibori-dyeing. 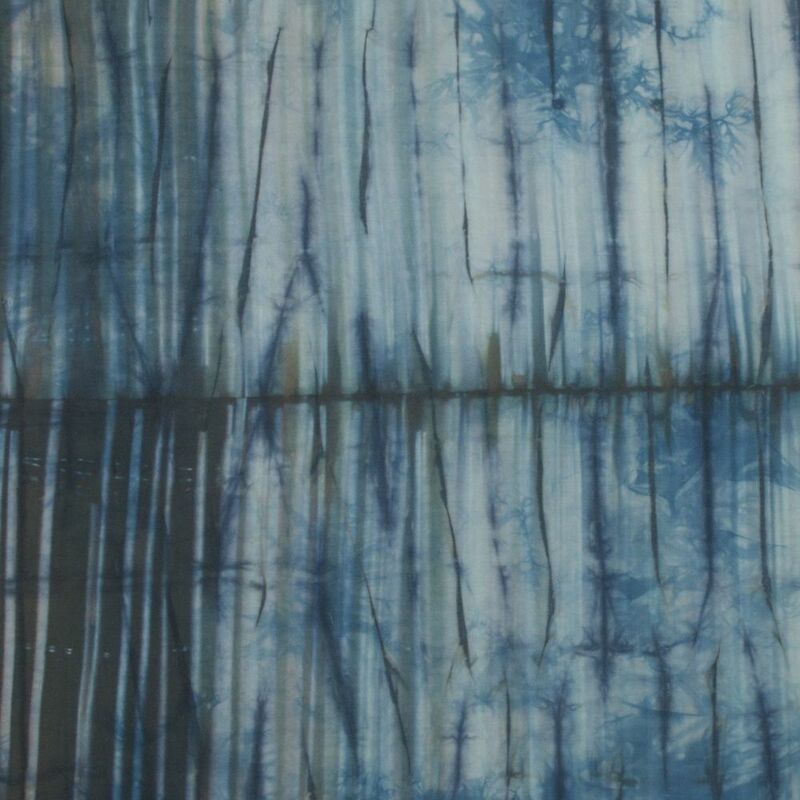 It means I get a palette of shibori-dyed cloth in different colours that are all related to each other. My colour studies are not usually about producing exact recipes for individual colours. They are more about finding sets of colour relationships. Because that is how I think about colour - no colour occurs in isolation, it has a "family" of related colours and it will look different depending on the colours you see it with. Often when I see a colour I like, it is as much about the context - the background or associated colours that set it off. If I use a photograph or an image as a design source for a colour scheme, I don't necessarily try to match the individual colours in it. 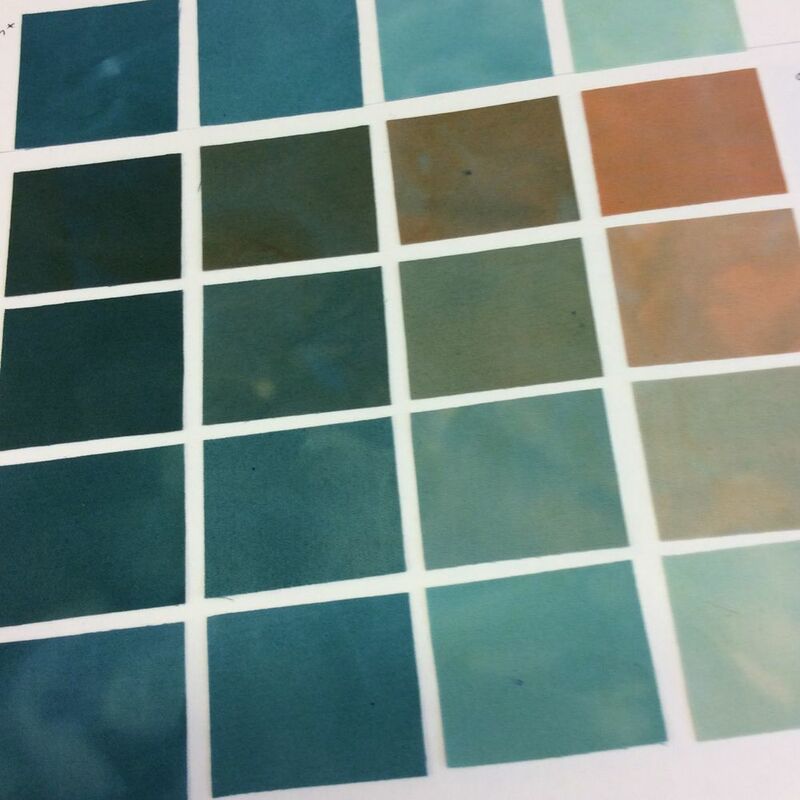 I will do some colour mixing and compare the colours in the image to the swatches in my dye book but what I'm looking for is the family (or families) of colours that will create a similar effect. There was a period when most of my work was based on the colours of a favourite painting by John Piper and for several months I worked predominantly with the family of colours I could generate from just two - Royal Blue and a rust orange that I mixed myself - extended with some Black and Dark Brown. So the point of this latest colour study was to test the potential of the pairs of complementaries I had found in the last to produce interesting neutrals and semi-neutrals. I started with the warm primaries (Scarlet / Golden Yellow / Royal Blue), which had demonstrated the greatest potential for producing brown. Then for the sake of comparison, I moved on to the cold primaries (Magenta / Lemon Yellow / Turquoise), not expecting them to produce many neutrals, but was pleasantly surprised by the range of cool greys and blues that did result. The combined results are pinned to my studio wall in the photo at the top of this post. I love how each family has its own personality colour-wise. In the second row are six versions of the same family, as I experimented with the effect of changing the relative strength of the primaries. When you arrange the results in a grid, the neutrals (if there are any) are almost always along the diagonal - where the "parent colours" are equal in strength and cancel each other out. Either side of that diagonal are subtle semi-neutrals - colours that are definitely blue or green or red rather than neutral, but muted, softer versions of the pure hues. If one of the "parent" colours is stronger than the other, sometimes the neutrals are shifted to a different diagonal, nearer to the weaker "parent". I extracted the neutrals and semi-neutrals and arranged them into palettes as above. This was when I could really see and appreciate these subtle colour combinations. This is what I would be likely to work from in future. 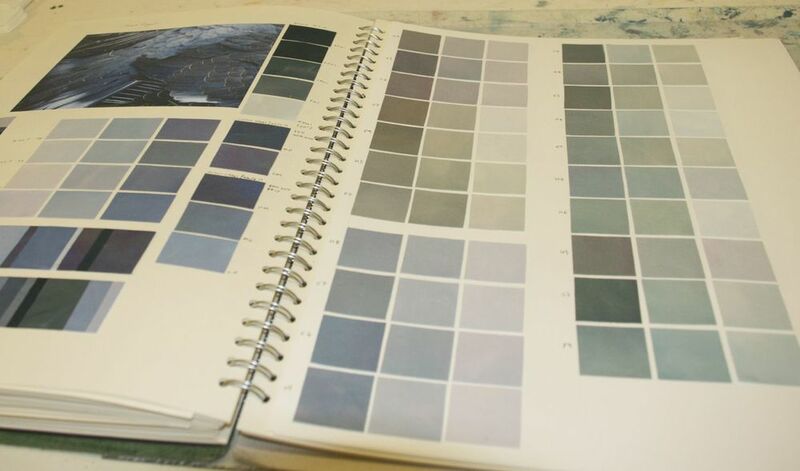 In principle I could reproduce individual shades, but in practice I'm more likely to use them as a basis for decisions on which combination, strength and ratio of dyes to use and tweak the results according to what I need. I finally completed this colour study this week. I had planned five variations (out of a possible eight) and ended up doing six. That's eighteen rounds of dyeing with twelve dye baths to set up and rinse out each time. Even by my standards that is a mammoth commitment. I definitely need a break and to do something else for a while now. This was all about dye colour theory. 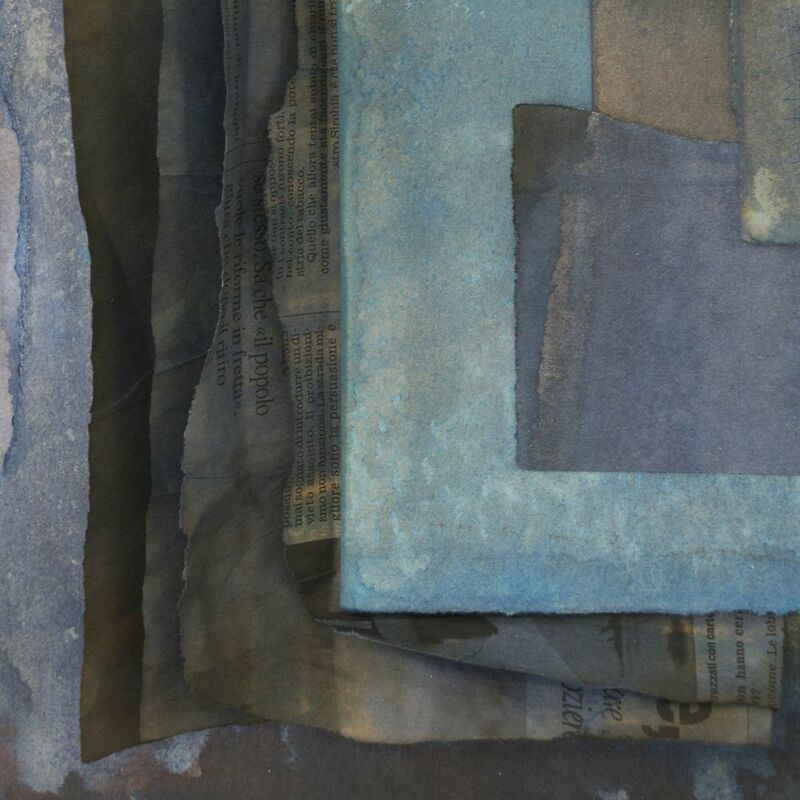 The point of the exercise was to explore what neutrals and semi-neutrals could be achieved by over-dyeing each colour with its complementary. I also tried this with the two split complementaries. The three warm primaries (scarlet, golden yellow, royal blue) are the most likely to generate neutrals (top row, middle card in the image above). You also get some lovely earthy greens. The three cold primaries (magenta, lemon yellow, turquoise - bottom row, middle card) are the least likely to neutralise - hardly any in fact. But replacing the turquoise with royal blue (bottom, left) resulted in some interesting blue-greys. Green over-dyed with red or red violet was more likely to result in a neutral than other combinations. If you only over-dye once, using the complementary is the most effective way to neutralise a colour. If you over-dye twice, the results achieved using the split complementaries are richer, more interesting and you generally get more neutrals. Following my last post, where I noted there seemed to be a bias towards green, I also tested the effect of changing the strengths of each dye concentrate. This confirmed that changing the strength of each dye in relation to the others would alter the colour. I know that sounds obvious but it was fascinating to see the effect of actually doing this. Basically, if I had mixed the yellow dye stronger and kept the red and blue equal, I would probably have had less greens and more browns. And if I had mixed the blue stronger instead, I might have seen more greys and blues. The disadvantage of this exercise was that it was not logistically possible to try out different values of these colours at the same time. So I am planning a phase two, which will involve selecting some of the colours from these results and using them as the basis for dyeing a "family" of lights and darks. Not yet though ... I need to do something different for a while! Effectively I have dedicated three weeks of precious studio time to this exercise. I had plenty of opportunity while dyeing, rinsing, cutting and mounting swatches ... to contemplate why on earth I was doing this. Was it the best use of my time? 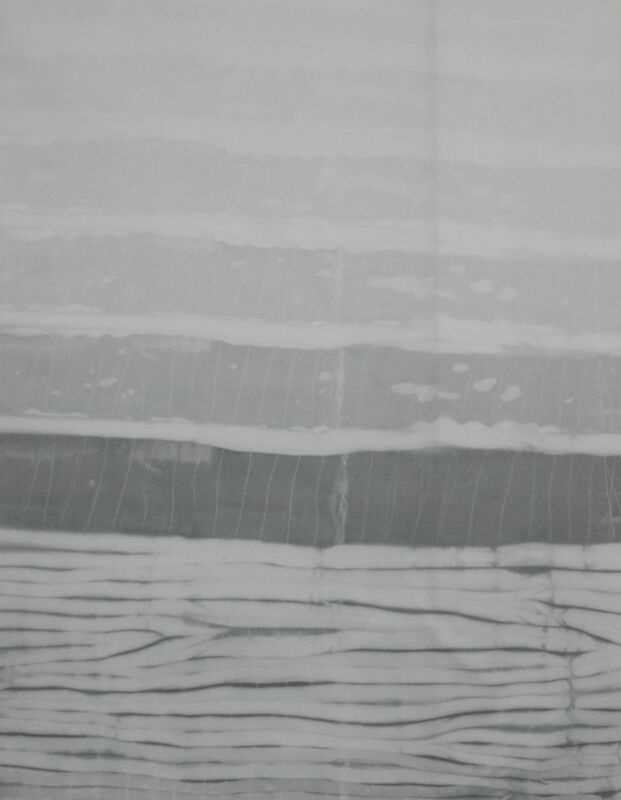 I could have been drawing, making new work, preparing cloth for shibori, mark-making with thickened dye, experimenting with wax resist ... all on my studio to do list. Part of it is just that obsessive wanting to know "what will happen if ...?" - that itch to resolve the tension between knowing the theory and not knowing what will happen in practice. The reward is all those surprise results - seeing two colours mixed together result in some gorgeous, unexpected new shade. That's the playful, self-indulgent motivation behind this exercise. But I came to the conclusion that there is a more serious purpose. I realised last year, when I did a workshop with Dorothy Caldwell, that colour is as important to my work as mark-making. And the kind of colours I want to achieve are the subtle, hard to define ones. Which means I do need to thoroughly understand how my dyes behave and how to mix those difficult colours. So the real reward for all that labour and studio time is the learning and the mountain of information I now have that I can draw upon in all my future dyeing. It's part of the underpinning research that will help me make better work. I'm also starting to think about developing a workshop based on this. Or maybe an ebook. I'm thinking not so much of an introduction to dyeing, but more of a colour theory for dyers course. Is there a demand for this? Would people prefer a course or some kind of online option? Leave a comment or email me via the contact form - I'd love to know what others think. There was no question about it when I looked in the dye vats after the first round. I had pink. Not bright Barbie-doll-pink (thankfully). A sort of greyish-plaster-pink in the pale vat ... maybe more like dull purple in the other two. Unfortunately pink happens to be one of my least favourite colours. I had about six metres of cloth divided between three vats and it had taken two or three days to stitch and bind all the resists ... definitely time for a major rethink. First step - figure out how a dye mix that was meant to result in a greenish brown had ended up pink. If anything the mix had looked too green when I made up the vats. The two purplish vats probably reflected how I'd adjusted the mix accordingly. My guess was that the lemon yellow dye had been shamefully bullied by the (tiny amount of) magenta and wimped out on me. Which reminds me (too late) why I usually prefer golden yellow. Yes, dyes have their own personalities. Red (especially magenta) is a bully, reacts quickly and easily overwhelms the others. Blue is slow to react, needing twice as long to reach a full depth of colour, but quite resilient once it's got there (try removing an unwanted turquoise stain). Yellow (especially lemon) reacts quite quickly but is a wimp and is easily overwhelmed by the others. 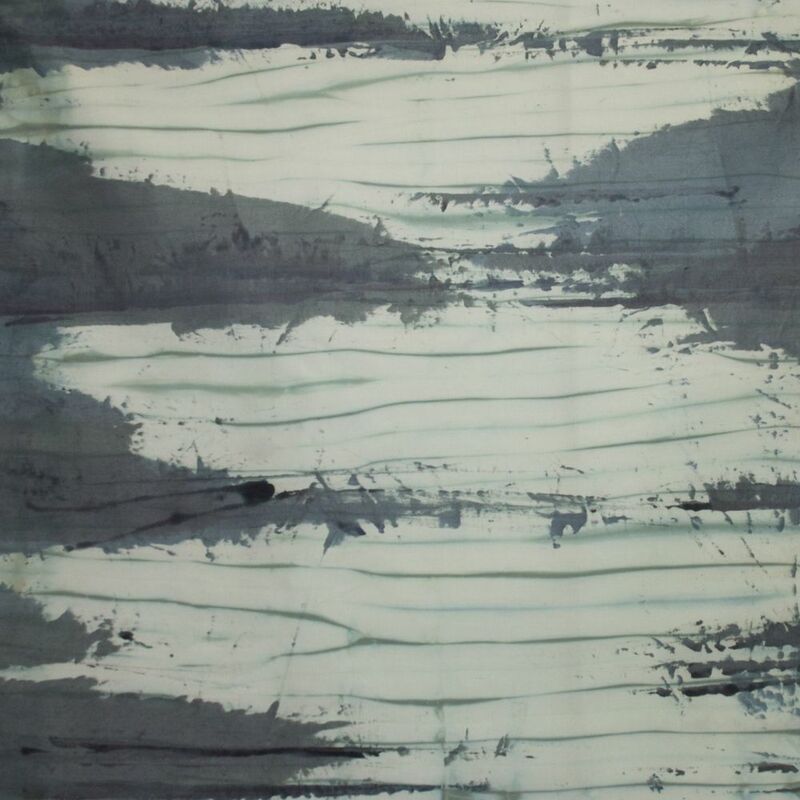 It's relatively easy to compensate for all this when you dye with pure colours, but there are good reasons for using a mixed colour in shibori. I've worked out most of my mixes using thickened dyes (more convenient) but I'm finding that a mix that works fine that way can behave differently in the vat. I think this is because of differences in the way the dye reacts with the cloth in each case. The daunting implication is that I am going to have to figure out a system to re-test a lot of my mixes in the vat. Meanwhile, I needed to figure out how to deal with all this pink. My original plan had been three blue-black vats, which should have given me a range of dark blues, browns and greenish neutrals. But to cancel out the pink tone, I needed some green. I decided to substitute turquoise for the royal blue I had planned to use ... and crossed my fingers. On the whole it worked. I didn't of course get the colours I'd planned ... I ended up with a lot more blues ... and I still have more pinkish tones than I want so may be over-dyeing some of these. Overall not the most successful results - although, as ever, there are some stand-out pieces. I was also using this dye session to experiment with clamped resists, in particular, partially clamping the pleated and stitched pieces. The results were interesting but on the whole the edge between the clamped and the unclamped section is a little obvious so this needs more thought. It didn't quite work for what I have in mind. 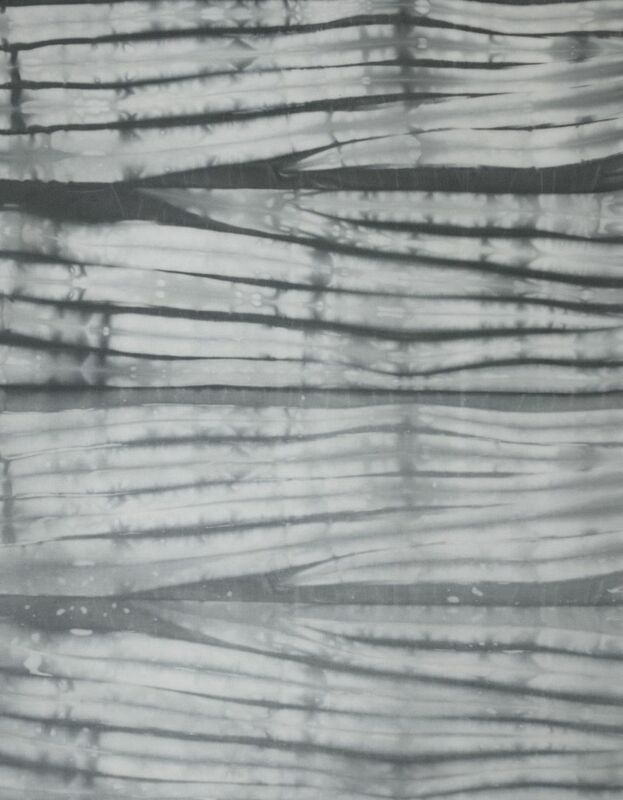 The other experiment was to try out ways of restricting the pleated shibori to just one section of cloth - without resorting to wax or similar. The colours were really not good, so I've greyed them out to focus on the marks. The one on the right is quite exciting with lots of potential for development. Guess what, this was the only sample in the whole batch with lemon yellow on it ... in all the wrong places! I was going to call a halt to this colour study but, having gone so far, it seemed a waste not to see it through. So it was back to colour mixing again this weekend. I abbreviated the system I had devised but even so, by the last few rounds I was losing the will to live. The constant repetition of measure, mix, test, clean tools, repeat. Concentrating so as to avoid mistakes - did I just measure two parts or three? If in doubt, scrap that one and start again. So, why was I doing this again? The original aim was to work out my own recipes for brown. Well, I achieved that. I now have 5 different standard mixes worked out. Two cool browns, two warm red browns and a kind of brown ochre. As a bonus, I also mixed some lovely greys. ... And who would guess that the difference between a warm grey and a cool grey would be magenta . Now I've done it, of course I can see how that would work - but I don't think I'd have figured it out in advance. And I think that was the larger benefit of doing this. 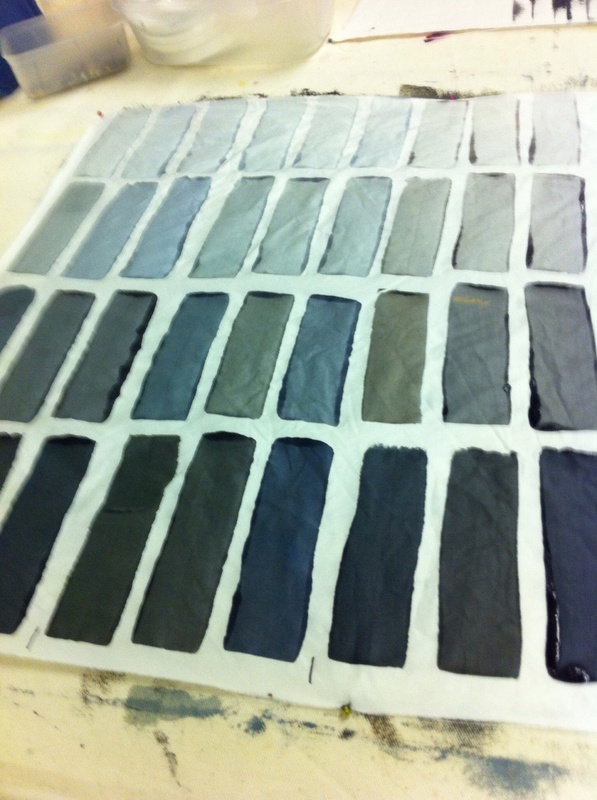 Learning to understand my dyes better and reinforce my grasp of colour theory. To mix brown and grey I had to master how to balance the relative value and hue of those bright primaries so that they would literally neutralise each other. Brown is the colour you don't want when you're colour mixing, right? Mix three primaries together and you end up with "mud". But … adding brown is also a good way to neutralise bright primary dyes to get subtle, earthy colours. 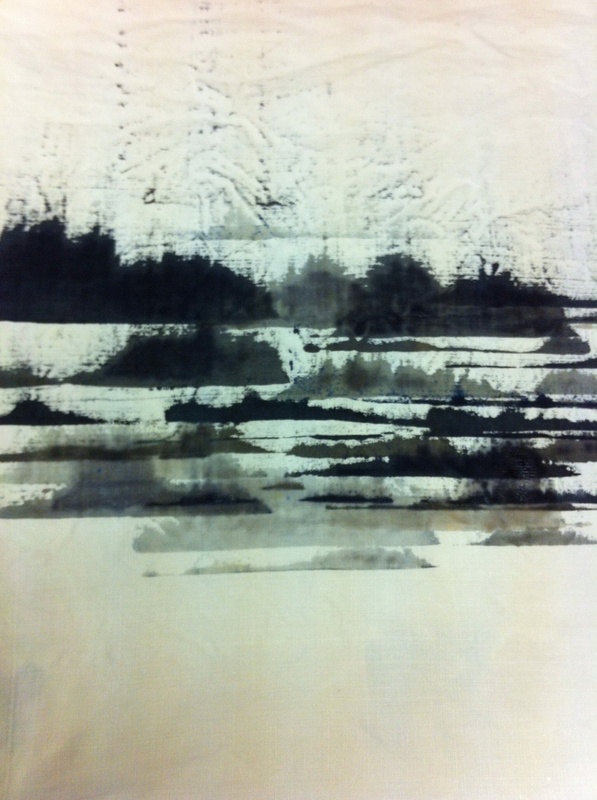 I've always used a pre-mixed black and a dark brown dye alongside my six primaries to tone things down. Until last summer I was happy to just use the dark brown I buy straight from the jar. But then I had a defective batch … and of course I only realised after I'd dyed several metres of cloth the wrong colours. So, I decided it was time to learn to mix my own. Well. There are 21 possible combinations of six primaries (if you use both the reds, yellows and blues together as well as separately). And then there are several possible ratios of each possible combination that could result in something brownish … But after a lot of experimenting I ended up with some really interesting … greens, reds, plum, violet … amazing how often you can mix all three primaries and not get "mud". But there were also lots of browns. Which was great, but now I need to narrow that selection down to two or three that I can use regularly. So I spent Christmas playing with dye. Not unusual in my household. I chose a few candidates from my now vast selection of browns and tried mixing them with blue or black. I was looking for the ones that would give me a palette with lots of cool toned neutrals (and not too much red or green). It was hard to mix consistent shades when the combination required several dyes so, now I know that for practical purposes I need mixes that use no more than four. These are the results. I was really pleased with the palette I mixed from the last batch - some lovely greys and cool toned browns. I still need a good reddish brown - but I need my studio back ….